- Designed to perfectly fit to filter plates. - The multi-well p late vacuum manifold is an anodized aluminum manifold that has been designed and optimized for the vacuum filtration of the multi-well filter plates. The use of SPE sample preparation can significantly enhance the robustness and reliability of many biological, pharmaceutical, forensic and environmental applications. We offer a full range of extraction accessories to complement both traditional cartridges and 96-well plate formats. 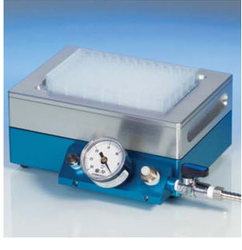 Vacuum Manifolds offer a simple way to quickly process multiple samples. • 1, 3, 6 and 9 number of branches. • Value Type:- 2way, 3way. 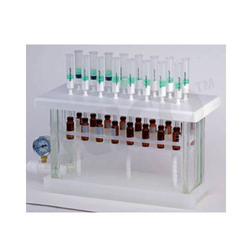 Our company holds vast experience in this domain and is involved in offering Vacuum Manifold.